My New Year’s thoughts do not circle around new resolutions, seeing as that I have already resolved to do everything possible to make this difficult existence more tolerable. Rather, my thoughts linger on the fact that we now live in a police state precipitated by Muslim immigration and the general coexistence with various and sundry other non-White people. Similarly, 90,000 security personnel were deployed in France. 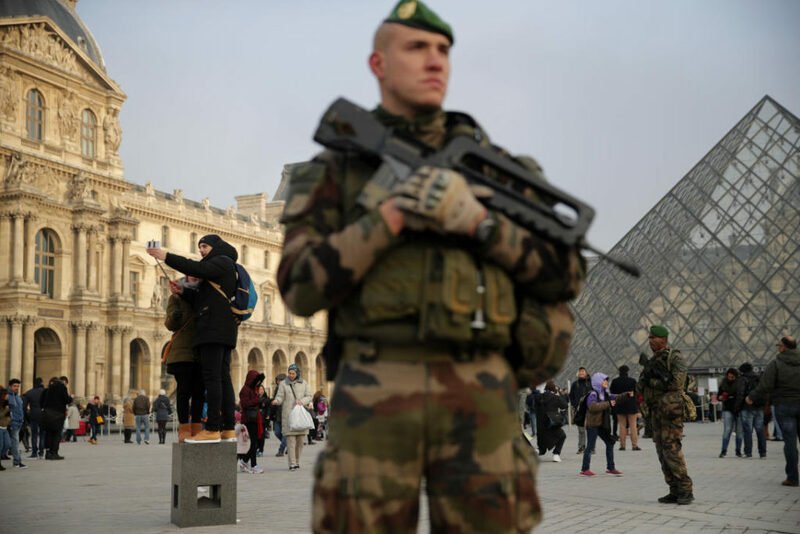 Camouflaged soldiers in Paris could be seen guarding key sites, after having experienced their dose of diversity via truck turned mass-murder weapon. And, according to the French government, it was a great success, as only ~1000 cars were torched by vandals. These are the memorable scenes and photographs which in and of themselves provide excellent social commentary on the depth to which Western Civilization has sunk, as though we were in a dystopian sci-fi film. This is not a civilization in optimistic confidence, but rather one that is girding for an enemy which might attack from all sides, and is especially apt to strike on those brief occasions when we seek to revel and celebrate life. Hence we can literally never relax, but can only put on a brave face if we wish to enter a public place, to show that “the terrorists haven’t won.” We congratulate ourselves for venturing outside in our own cities as an act of defiance. Suffice it to say that we are a little beleaguered at the moment. Surely I honor the military and policemen, but to probe no further would be akin to leaving the Iraq debacle to the refrain, “I support the troops”, without further analysis. Yes, we “feel safe” with an overwhelming police presence; but let’s not be satisfied until we ponder the melancholy state of affairs that led to major European and American cities being under lockdown during times meant for joyous celebration. No, this is not “the most important thing.” Rather, it’s the manifestation of a lack of critical thought and imagination; in other words, the failure to imagine a better world. The “most important thing” is that we have lost our dignity, our security, and our feeling of even having a home—or a homeland, if you will. To name just one indignity, think of the humiliating farce we must partake in when boarding an airplane, something that perhaps comes to mind after traveling for the holidays. We remove our belts and shoes amidst perfect strangers, must throw away any beverage we might be enjoying that has to be wastefully repurchased once inside the gate, and frenetically stow away other items according to an arbitrary but strictly enforced regimen. All this is done in a kind of frenzy, as though we are all indeed guilty and paying penance for some grave crime committed in a previous life. One begins to suspect oneself under such circumstances. And then there are the various other intrusions, such as being subject to pat-downs like a common criminal on the flimsiest of pretexts. And all that intrusiveness is never enough, as the recent shootings at the Ft. Lauderdale airport show. Compare this panicked environment to what must have been a relatively tranquil boarding process of every day Americans prior to 9-11, who were generously given the benefit of the doubt that they were not radicalized terrorists bent on mass homicide. What would it feel like to not be regarded as a terrorist by your own government? Alas, it was another world. Rather, I would invite you to imagine your typical non-White TSA officer. This is really about patriotic Americans being treated like terrorists thanks to the actions of actual (Arab, Muslim) terrorists. And now we are suspect? My, that is rich. And yet one hardly sees the status quo analyzed in this light; but rather it is looked upon as a fait accompli. Draconian security measures are simply “the new normal,” to quote French Prime Minister Hollande. Not only is flying inherently unpleasant (extremely unpleasant in my opinion), but we must now endure what often amounts to a racial insult, and frankly an insult to common sense, as we are all considered equally suspect of seeking to blow up an entire plane of innocent people. Now let’s be honest, that objective is reserved for Arabs and others of their strange religion. Yet why do I feel as if I am alone in my indignation at this state of affairs? As a kind of “Aryan” looking man, I find myself especially singled out by security in various contexts for the most ridiculous reason. In particular, they stop me in order to show that they’re not biased. After all, if they want to see the receipt of the guy who looks like he could be in the Luftwaffe, surely there is no discrimination at this retail establishment. I should be happy to sacrifice my self-interest to such a noble show of fairness, no? Actually, I do not suffer such impositions in good humor; I am not a good sport about it. Similar to the TSA situation, I do not applaud their effort to stop terrorism (or theft in this case); rather I abhor that they must use me to keep up a pretense that White Americans are somehow the perpetrators of the crimes and other malicious acts they seek to detect. I don’t smile at a system that sabotages my country through mass Third World immigration, and then in the next turn takes away my dignity and freedom as a response to the inevitable collapse which such immigration portends. Pretending that an Aryan-looking White guy or White grandmother in a wheel chair is as liable to commit terrorism or theft as a Muslim in a hijab is simply a lie, and I therefore regard every enforcement of this false premise as though a lie were being told to my face. As such, we need not put the above complaints into the context of racial resentment (though they are that too). This falls under the rubric of honesty. If you abhor dishonesty and hypocrisy, if you value the contributions of your ancestors and the sacredness of your homeland, you must abhor the police state as a reminder of a kind of Paradise Lost. This police state is necessary perhaps, given the circumstances our hostile elites are subjecting us to. But it is not to be accepted without some critical analysis. On a positive note, we can be happy that we now have a president who has a realistic view of the source of terrorism as a consequence of the Muslim invasion. Banning Muslim immigration is only common sense, even if a tiny percentage of them actually carry out these crimes (and the substantial percentages of Muslims approving them). But the present reality is that Americans are being punished for some unacknowledged sin for which they must bear the burden and forever be under suspicion by a forbidding authoritarian state.